The title is literally the problem. Temple elephants suffer deep leg wounds from the iron shackles that keep them bound so they can be used in lavish parades and celebrations. While the people attending the festivities may wonder at the beauty of these brightly decorated animals, the elephants themselves are often in pain. Sangita wants to help relieve the suffering of by improving the living conditions of elephants throughout India. This dramatic presentation can be the catalyst in raising awareness among the public to demand that elephants receive better treatment. As you might expect, such an undertaking is not cheap. Even with experts donating their time, tens of thousands of dollars are needed to finish the pos-production phase and get the moving into public release. One means of doing that is through the Gods in Shackles campaign on Indiegogo. As a contributor at any level, you have the opportunity to support this important project and garner a valuable thank-you gift for yourself. One piece in particular is very special. 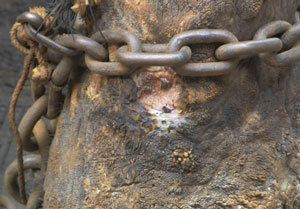 That is an actual chain link from a previously shackled elephant, now released. It’s yours at the $75 contribution level. Many other desirable premiums are also available starting as little as $5. This entry was posted in Advocacy, Fundraising, General and tagged documentary, elephant, Gods in Shackles, India, Indiegogo, movie, Sangita Iyer on January 31, 2015 by johnshepler.